I am working on an Orange, for this week....it's still in the fridge...opened and pulled apart, for a better drawing. This was the 'whole' before I tore into it. My Sweet Hubby will retire in one week.... but today is his last full day of practice. Wow...where did the years go?? I will optimistically look forward to our years ahead. I admire this man, who woke each and every day (very early, I might add) and went to work at the very same place for 36 years. That is no small feat, and I fear that he will miss his patients, and friends and a staff more like family than staff. But he feels like flying free for awhile, before the age of infirmities hits him...and I plan to fly right along with him. I will be drawing and blogging and enjoying the moments that are ahead of us. "Orange you glad for the good days??" So, back to the drawing board for me.... just wanted to share some good news from our home. So, maybe you can tell from these three photos....which one I was working on. For once, I am pleased with the outcome... can't say that very often. Enjoy this last glimpse of the Amaryllis. I promise that I won't share it again. But, you have to admit, that it is just an amazing plant and it certainly has made January pass a lot more quickly. This week, I am working on an Orange....not just any orange, but a very special variety, which is mighty big. It's just in the sketching stages, but hopefully, I will have something to share very soon. I hope I did this plant justice!! I played with the i-photo and enhanced this one a bit. 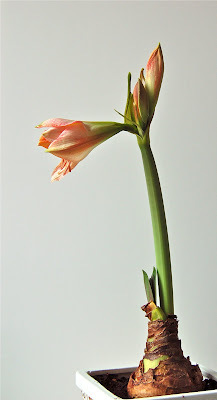 Again, I have been given a beautiful gift of an Amaryllis. but it needs time to grow and bloom. I love this plant because it just keeps on blooming. sometimes 'bleak' month of the year. and the bright colors will come again. For now, it will be a gentle pink bloom, which is just fine. 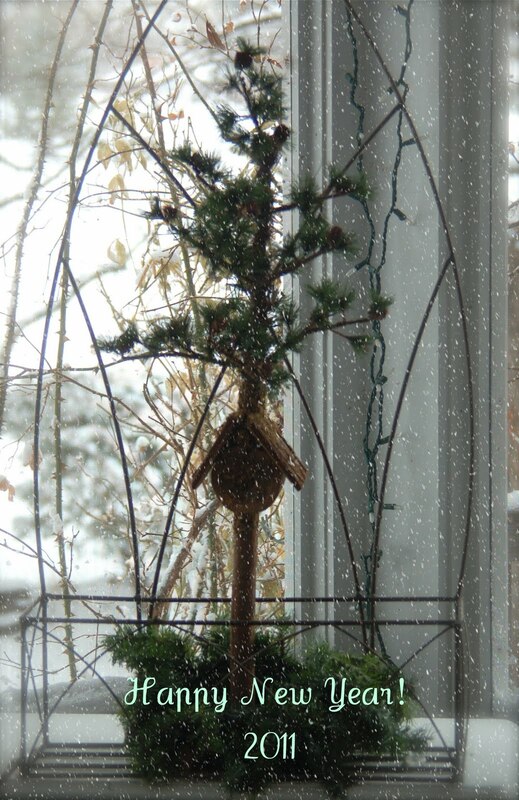 We spent yesterday inside, staying warm, while the snow storm whirled around us. I took advantage of the time (and the fact that my studio was freezing cold), to take down the Holiday decorations for most of the house. It was snugly inside, while it was darn cold outside. Today, the sun was brighter than bright. I love the brilliance of a new snow when the sky is totally clear and the sun sparkles on every element. It can blind you at times, but it is the clarity that I enjoy. So, here are a few photos to share.....from a brilliant morning. A Beautiful day for a walk in the snow. Today, it was 30 degrees or more and the SUN was sparkling on everything. I couldn't help but take my camera on a walk. I had so much fun. planted long before we moved in (Years ago). I love the bright red of the berries. The snow melts so quickly when the temperatures warm. In this arid climate, the earth just can't wait for a drink. that is, bundled to the max, in my down coat. It is the last day of vacation for most of us. Reality hits on Monday (it's Sunday afternoon, as I write this). It's been great....so much fun....but there is much to do in the new year, and I plan to start tomorrow. I will have to get rid of bucket loads of chocolate...in order to start back to a healthier lifestyle, but I plan to get out and walk as often as I can. I hope that you all had a good break and are ready to dig in, during these winter months. I have been working on a Kohlrabi, from a class taken several years ago. I put it aside, after the class, and hadn't touched it. When I saw it several weeks ago, I felt a renewed confidence to try again. I have pulled out the file on it and will go through my sketches. I plan to photograph it this week, so you can get an idea of what it looks like. 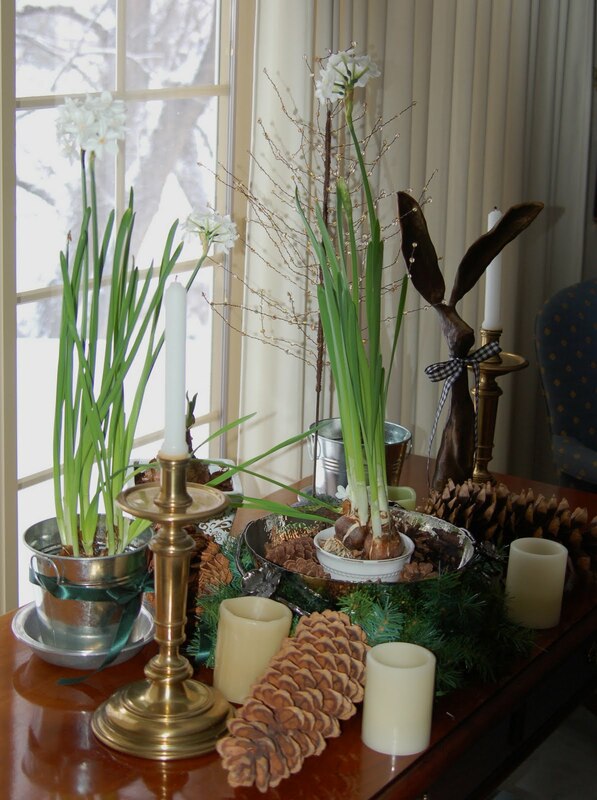 Several friends gave me wonderful Amaryllis bulbs this year....so, I wanted to share them with you. Chauncey, the rabbit, keeps an eye on them as they are tucked behind the Narcissus (which are blooming away right now). The Amaryllis certainly help January doldrums. I will keep you posted. 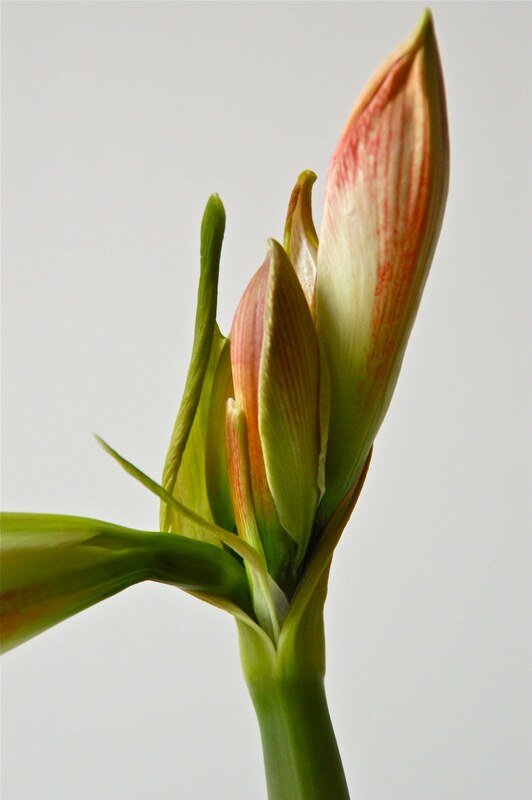 as the Amaryllis begins it's ascent. This was our "Happy New Year" snow. Happiest & Healthiest of New Years to you all!! Yes, it is 2011 !! My goodness, the holidays flew by in a whirl of parties, visits from one set of kids and phone visits with the other, as well as, celebrating with good friends. We finally have gotten some snow to celebrate the new year. Honestly, it was such a warm Christmas, that we barely wore our coats.....vests seem to do just fine. However, now that the snow has arrived, the temperatures are much more 'normal' and quite cold. We plan to bundle up today and take a walk in the New Year. We are so looking forward to this year, with a renewed spirit. My son is going to help me with a new website ..... (His plans are big.... and I am going with it....out of my comfort zone!). My husband is going to make some huge transitions in his life..... and we hope to do more traveling. I am also looking forward to more time in the studio....or sketching in the field. I plan to purchase a laptop, so that I can be with you where ever I go. 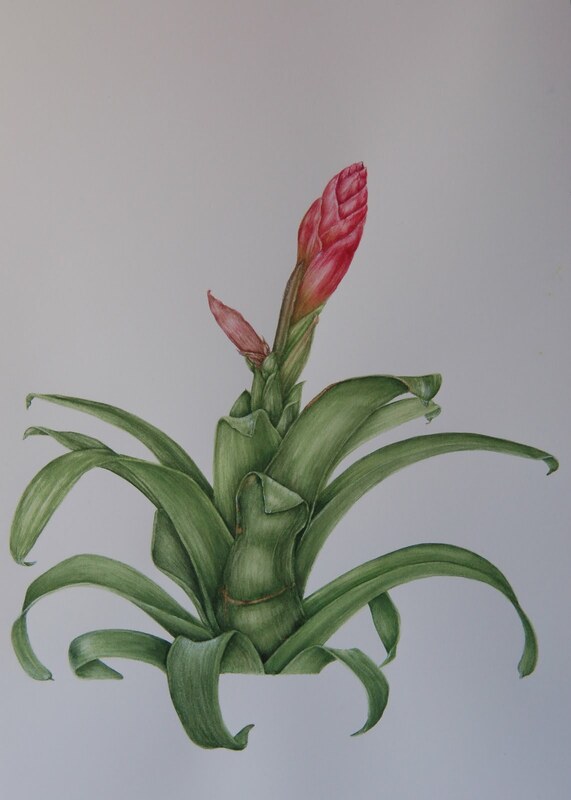 I am on the lookout for new subjects, be they tropical, exotic, or just the average plant with a new perspective. I hope that good health and prosperity follows all of you this year. This past year seemed to stretch many of our friends on health issues....don't wish that for the upcoming year. Also, so many people are struggling financially, that I hope that the economics of life stabilize for many this year. Of course, I want the best for people.... no struggling.... but that is not realistic, I know. So, I will hope for the best....and keep calm, as I carry on.